Each piece of Klem’s art glass reveals her love of the design and creation process, the taste for technical challenges and the beauty of a well-finished piece. Strongly influenced by geometry, repeatable patterns, and phenomena such as crop circles, Klem designs her pieces for beautiful yet functional art. 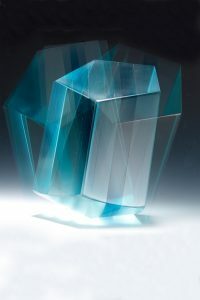 Beginning with large sheet glass, Klem creates custom pieces, incorporating one into another, assembling and fusing them together. 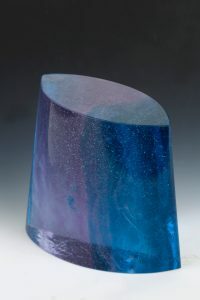 She then slices, grinds, sandblasts, or extensively shapes the resulting glass to enhance the visual impact of the piece. Further firings, shapings, and polishings produce finished trays, vessels and sculptures. 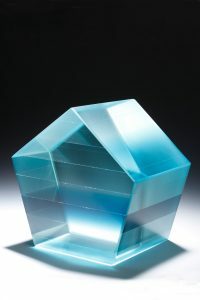 “Features: Ann Klem Glass” will be on display September 1st through November 11th, with an opening reception coinciding with Frist Friday Gallery Hop 6-9pm the evening of the September 1st. A live glass blowing demo by Flame Run artists will take place in the studio at 7pm.